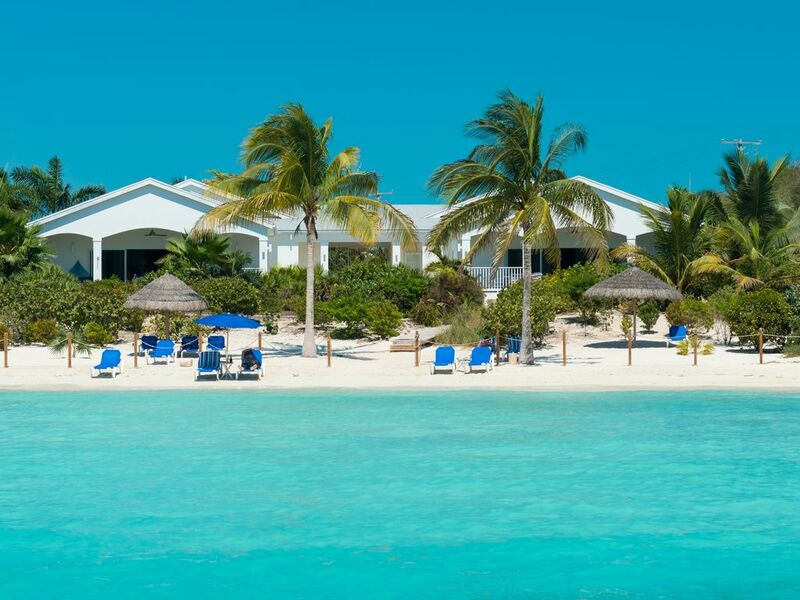 3 Bedroom, 2 Bath Suite with sparkling sand beach and crystal clear, calm water! Coconut Beach Villa is a brand new, luxurious beachfront villa, right on the most wonderful beach on Provo, Sapodilla Bay Beach. The water is so crystal clear. The sand is so sugary white! The islanders have nicknamed the beach, The Children's Beach - a perfect retreat for children of all ages! The water simply laps at the shoreline, because there is so very little wave action. Watch carefully and you will see our turtles pop up their heads throughout the day! If you are really fortunate, you will see our dolphins frolic in the waters off the point! One Coconut Beach Villa Suite has three bedrooms and two baths. It is arranged in a duplex design, having two identical suites, side by side on one floor, separated by the central shared swimming pool. This listing is for our North Suite. Inside Coconut Beach Villa! : One of our suites can sleep six people in rooms. There are two King bedrooms. There is a bedroom which has two twin beds in the trundle daybed. One Coconut Beach Villa Suite has two baths, featuring European fixtures, including a bidet, and a luxurious step-in shower in each bathroom. The living area has a magnificent panoramic view of Sapodilla Bay Beach, which is at your doorstep across our private boardwalk. The furnishings are upscale and comfortable. Pure vacation luxury! The great room has a flat screen TV and cable, for those evenings during which you just have to sit back from a day in the sun. Our fully equipped kitchen is state-of-the-art, with stainless steel appliances and granite counter tops. Counter stools at the large granite island allow guests to watch the chef among you prepare a fabulous meal! We love to chat about our villa. If you have questions, please ask! We will do our best to address them quickly! You may rent the Entire Villa or you may rent just one of the two bedroom suites. The suites are identical; if you rent just one, then the only shared amenity is the swimming pool! Please check with the owners regarding your individual needs! There are so many things to do! We live on island and we love taking care of our guests. We would love to have you stay with us! PLEASE CONTACT US DIRECTLY BEFORE you make a REQUEST TO BOOK. Although the calendar is automatically marked when a reservation is made through the Homeaway/VRBO system, we do have past guests for whom we mark the calendar ourselves. We do not want to disappoint anyone if we have inadvertently missed marking the calendar herein. REVIEWS! REVIEWS! REVIEWS! ……..Over 425 Five Star reviews across various listing sites! KEYWORDS: Beach with beautiful white crystal sand, world class Scuba diving, one of the top 10 golf courses in the Caribbean, deep sea fishing, bone fishing, shopping, restaurants, sightseeing, day spas, swimming, snorkeling, boating, water skiing, jet skis, wind surfing, hobi cats, sailing, parasailing, horseback riding, shelling, hiking, fabulous sunset watching (look for the green flash! ), Glow Worm excursions, whale watching, rock iguanas visit, bird watching. AIR CONDITIONING Estimate: Guests are charged $0.75/kwhr used, a rate which is based on our historic costs. During the last year, our conservative guests who used AC set the thermostat on 85 degrees when no one was present in the home and on 78-80 degrees for sleeping. They spent $150 per suite on average, with a range of $114 to $479 for a week. Two guest groups spent $383 and $479 for a week. The majority of our guests did not use AC at all. Our home has a sub-meter which measures usage for AC specifically. Electricity on island is considerably more expensive than on the mainland. You simply won't believe Sapodilla Bay Beach! It is truly a gift from God to us all! Our home fits perfectly on this most wonderful beach! Having a duplex is amazing! It offers one the opportunity to stay on fabulous Sapodilla Bay Beach. The benefit of the property is that you can rent just one suite and have this opportunity for a lot less than renting the entire home, sharing just the swimming pool. Or you can rent the entire villa and have some private space for various members of your group! The best of all worlds! Bath one is completely private to the bedroom. Bath two is connected to the second bedroom and the hall. It could be used by the guests who sleep in the study. Fully equipped, luxury gourmet kitchen. Granite tops! Stainless appliances! Beautiful amenities! Two dining areas, inside and outside, each seating six people. Private to the villa. Shared if differnet parties rent each of the two suites. Coconut Beach Villa is located on the most spectacular beach on the island, Sapodilla Bay Beach. Our Villa is a duplex. You may rent one suite or both. If you rent one suite, it is likely that there will be another party in the other suite. However, the suites are completely separate. You may spend as much time or as little time with the other party as you like! Optional air conditioning is available at additional cost which is based on metered usage. Our swimming pool is private. If two separate parties rent our suites, then it is shared between the two parties. Full Kitchens: Stainless steel appliances. Glorious granite counter tops!. A very quiet dishwasher!. We offer unlimited local calls. Long distance calls require a credit card. Other Amenities: Pack and Play with linens, Security System, Lounge chairs and Beach Chairs, Private boardwalk to the beach with foot shower, Prolific tropical landscaping. This was our third visit to Coconut Beach Villa. I'm not real good at writing reviews, but we really LOVE this place! It's PERFECT for families and kids. A real gem that we can't resist re-visiting! Exceptional. Coconut Beach Villa on Sapodilla Bay is very private with calm crystal clear waters, a beautifully landscaped yard. It's well maintained by local owners, and well stocked for home cooking. We ate in more than we had planned because you could't match the sunsets and relaxed atmosphere. The shallow calm waters are perfect for paddle boards, kayaks, snorkeling. We rented a car and snorkeled at all the recommended sites. Kalookis was our favorite restaurant - fresh food, tropical drinks, friendly helpful staff, and a beautiful beach setting. If possible, bring some food items, coffee, etc from home as the well stocked grocery stores can be expensive. This villa is on a fanatastic beach! The view from the villa is breath taking. This villa faces west so the sunsets are spectacular. What more could you ask for. We will be back! we had a fantastic time. the villa is gorgeous, well equipped and furnished and in a magnificent setting. the sapodilla beach is very quiet and safe and it makes it perfect for a family holiday . we had complete relax . the owners are very helpful . in other words , we will come back! We are frequent travellers and this is One of the best places we have ever stayed , the beach is spectacular , crystal water, quite hardly no one on the besch all week , the house is immaculate and clean looks brand new , everything worked just fine and great hosting by Dana and Scott .